I'm driving my Bongo in France this summer, what safety kit do I need? As from last year you need to carry not only a Warning Triangle in your car but also a CE Approved High Visability Vest, Tabard or Waistcoat (High-Vis) while driving in France and failure to do so could cost you a hefty on-the-spot fine. 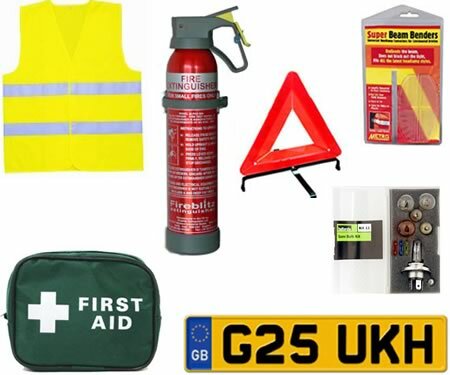 The High-Vis Vest must be carried inside the car and not in the boot in case you breakdown or accident in a dangerous place – you can then get your High-Vis Vest on before getting out of the car. The Warning Trainagle needs to be placed 50 to 150 metres behind your Bongo in case of breakdown. You are also required to carry a First Aid Kit as well as a Fire Extinguisher in your Bongo, as every driver is required to stop and provide assistance in case of accident in accordance with the European Good Samaritan Law. Headlamp Beam Adaptors are required to stop your Bongo headlamps dazzling oncoming motorists. These need to remain fitted day and night. A GB Licence Plate is required as drivers are legally required to display country of registration on the rear of their vehicle by International Law. This is also applies for caravans and trailers. A Spare Bulb Kit needs to be carried as lights must be in full working order at all times.